Welcome to the Ultimate Party and Play Center for toddlers and kids up to 11 years old. Children love nothing more than to climb, slide, and jump. If you?re looking for birthday party ideas or a place to bring the kids to play ANYTIME you want, come to Jump & Jacks. We have the largest kids? indoor playground in Ohio in addition to private party rooms, a caf?, and endless action packed activities. 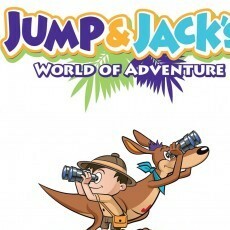 Jump & Jack?s is one of the most spectacular places in the region with lots of things for Cincinnati kids to do! For children?s birthday party places, search no further than Jump & Jack?s. We?ve got two main play areas: Jack?s Playground and Jump?s Inflatable Play Yard. Birthday parties for kids have access to a private party room and the most awesome play experience in town. Treat your children and their friends to a kid birthday party they?ll never forget!